On a dreary February day in 2018, Contra Costa College Foundation Director Sara Marcellino answered her phone. 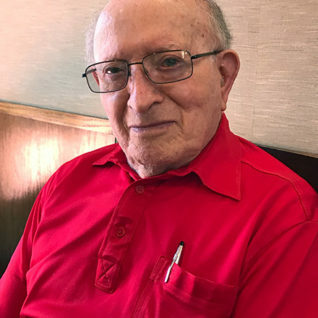 Sam Genirberg, a 93-year-old Jewish activist and resident of El Cerrito, was on the other line. He was calling in response to a personal note he had received from the foundation, thanking him for the donation he had made in support of students. During their conversation, Sam shared that he was interested in making an even more generous contribution. In fact, he wanted to know how he could help generations of CCC students invest in their future. Sam understands what a difference help can make when one is just getting started. He and his wife, Rose, immigrated to the U.S. in 1948 with $50 to their name. Both had narrowly escaped the Holocaust. Sam fled his hometown of Dubno in Ukraine, then survived by assuming a false identity and hiding in plain sight in Nazi Germany. Rose survived Auschwitz and Bergen-Belsen. Through Rose’s uncle, Sam and Rose obtained sponsorship to immigrate to the U.S.
Once they settled in Petaluma, Sam opened a chicken farm, with the help of a loan from Hebrew Free Loan. Because someone in the Hebrew Free Loan office believed in him, he was able to run an ice cream shop, and eventually manage a successful real estate business. He has never forgotten their support. Starting this year, Sam will give Contra Costa College students a similar opportunity via the new Genirberg Family Scholarship. Thanks to his $50,000 donation, the foundation will be offering four awards of $2,500 annually to continuing students in CCC’s career education programs. Sam hopes that his generosity will help recipients reach their next educational and professional level. He says it takes good, old-fashioned hard work to make it. But, sometimes, a little bit of financial support helps, too.